While in Minnesota last week, I had an assignment similar to assignments I’ve had many times during the past 20 years: to spend a day with a small community newspaper group, meet with the management and staff individually, then propose two optional plans with the same goal in mind. The goal was to improve the editorial and production workflow, thereby improving the quality of the publication and efficiency of the operation. Sounds simple enough, and having completed similar assignments hundreds of times before, I felt up to the task. Every newspaper is different, so I keep their particular needs in mind when offering advice. This group is in a process that many of us find ourselves in: determining whether to tweak the current workflow using the tools available, or to upgrade hardware and software throughout the organization to achieve monumental jumps in efficiency. I understand the dilemma. Having owned several publications in the past, plus a couple of companies right now, I know what it’s like to make upfront expenditures in order to see longterm gains. d find a higher paying job somewhere else? The questions go on. What about camera raw? Will it improve my product or just slow down my workflow? Am I spending enough time on my digital products or am I possibly spending too much time on them? Speaking of staff, do I have too many or too few? Are they organized in the most efficient manner? Should we create our website in-house or use an outside vendor? The questions could go on forever. It’s enough to bring on a panic attack. Don’t panic. Let me suggest a few things to think about when faced with similar questions. Let us consider hardware and software today and I will discuss other issues in upcoming columns. Q. Is my hardware too old? Is it all going to come crashing down? A. Hardware is a delicate issue. One of the quickest ways to improve efficiency is to improve the tools we use. Why do you think Amazon is always investing in new robots and distribution methods? However, hardware isn’t cheap and no one wants to waste money. I would sugges t newspapers look over their current hardware and ask a few questions. How old are my computers? If you are working on machines more than six years old, chances are they are getting pretty slow and produce all kinds of delays. I’ve noticed six years is kind of a magic point for computers. Yes, Macs can last forever, but like anything else they slow down in time. And Windows-based machines slow down more quickly than Macs. It’s just a fact of life. I have four computers I primarily use in my work. One is an eight-year-old iMac. It still works and is fine for word processing and less intensive processes. But, I notice lately that it even slows down during simple tasks like checking email. I wouldn’t dare waste my time trying to crank out pages on that computer. Sure I could do it, but it would take three times as long as creating the same pages on my two-year old iMac. Q. What can I do to get the most of my current hardware? A. If hardware is slowing down your workflow but new computers aren’t in the budget, one of the easiest ways to get more from your machine is to maximize its RAM memory. RAM isn’t expensive these days and I’ve seen machines double or even triple in speed by upgrading their current RAM to higher levels. Most computers can hold 8 to 16 gb of RAM. Check to see how much your machines currently have and how much they can hold, and make an investment (usually under $100) to maximize the memory in each machine. Q. Is my software too old? Do I really need to pay a monthly fee to keep from falling too far behind? A. Maybe, maybe not. Approximately a third of the newspapers I visit are using the most recent design software. If you’re an Adobe user, that means the Creative Cloud version, which requires a monthly subscription. Does this mean you’re behind the curve if you have older software? Again, maybe or maybe not. I don’t work for Adobe or Quark, so I have no reason to mislead you. You don’t have to have the latest version of InDesign or Quark to be efficient. 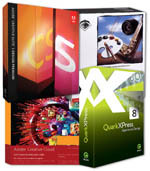 I have three versions of Adobe’s software on the machine I’m using right now: CS5, CS6 and CC. I’ve noticed no big difference in speed between CS6 and CC. That’s also the case on other machines I use. So if your staff is using CS6 software, speed probably isn’t an issue. If it is, you should check the RAM memory, as mentioned earlier. You may want to upgrade to Creative Cloud for other reasons but speed probably isn’t one of them. 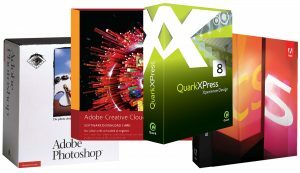 You might even be OK with Adobe CS5 or 5.5. If things seem to be moving along nicely and you are getting your ads and pages out in a timely manner, you might be safe for now. I wouldn’t plan to use CS5 for several more years, but your operation won’t come crashing down in the near future due to software issues. However, if you are using really old software like CS or CS2 (even CS3), your days are numbered. One day in the not-to-distant future you might walk in to learn no one can get their pages out. Even if that weren’t a possibility – and it is – it’s taking at least twice as long as it should to get your product out the door using old software. CS3 was released just under ten years ago. Not many of us are driving the same cars we were in 2007. And if we are (I’ve had mine five years), we’re probably thinking about upgrading to a newer model. It’s interesting we often update our cars before updating the things that provide our financial security. We forget that time is money. If it takes twice as long to get an issue designed due to old software and computers, the amount of time it would take to recoup the cost of new equipment is minimal. As I tell my clients, I’ll be home in a couple of days. So do what you think is best. But if it were my decision, I wouldn’t wait too long before upgrading any older software and hardware.